VpCI-422 is a rust remover that is harmless to people while effectively removing rust and tarnish from steel, iron, copper, brass, chrome and aluminum. 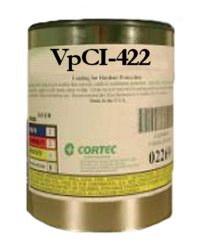 VpCI-422 removes corrosion from metal without creating waste disposal difficulties. It will not harm skin or adversely affect most paints, plastics, wood, textiles, ceramics or rubber when used as recommended. Removing corrosion from metal is easy. Just apply VpCI-422 and rinse with water. VpCI-422 is completely organic, 100% biodegradable and does not require special disposal for typical use. It is especially helpful for outdoor and marine applications where chemical waste disposal can be a problem. In rare situations, waste treatment may be required if a sufficient quantity of pollutants are introduced to the chemical solution. Unlike conventional rust removers, which can be extremely dangerous to use, handle and store, VpCI-422 is so mild that minimal protective covering is needed. In addition, the non-toxic, non-flammable formulation has no pungent acid or caustic fumes. Being nearly odorless and extremely mild makes VpCI-422 easy and safe to use. In contrast to harsh industrial chemicals, VpCI-422 can be used in labor-intensive areas such as continuous assembly and packaging lines with no adverse effect on production efficiency. Removes rust and corrosion from ferrous and non-ferrous metals. Non-polluting and environmentally acceptable for easy disposal. Cleans rust stains from painted, wooden and other surfaces. No adverse effects on most paints, plastics, wood, textiles, ceramics and rubbers. Safe, non-toxic, non-flammable formulation and mild odor makes it ideal for in-plant use. Passes ASTM F-519-05 "Mechanical Hydrogen Embrittlement Evaluation of Plating/Coating Processes and Service Environments"
VpCI-422 can be applied using spray equipment including air and airless spray as well as by brush or dip. For spray, brush or roll-on application, remove loose rust or tarnish. Then apply VpCI-422 concentrate to surface, let chemical stand for 10 to 15 minutes and rinse with water or an alkaline solution to neutralize. Typically little or no rubbing is required. Reapply if necessary. Medium and heavy rust will take somewhat longer. For dip application, remove heavy deposits, loose rust or tarnish. Soak part(s) in a tank as long as required to remove corrosion. Remove part(s) from tank and rinse with water or an alkaline solution to neutralize. Increasing temperature up to 150 degrees F (65 degrees C) will speed the cleaning process. Available in 5 gallon steel pails (Cortec Product Code 11600103) or 55 gallon metal drums (Cortec Product Code 11600104). 5 gallon drum weighs 50 pounds and ships under our standard shipping rates. The 55 gallon drum must be shipped by truck. We will provide you with a freight quote before we ship this product. Store product in a heated warehouse to avoid freezing. Minimum storage temperature: 32 degrees F (0 degrees C) and Maximum storage temperature: 120 degrees F (49 degrees C).